ABOVE: The stage of the Teatro Olimpico, showing the perspective stage set through the proscenium arch. INSET BELOW: Entrance and amphitheatre with loggia. 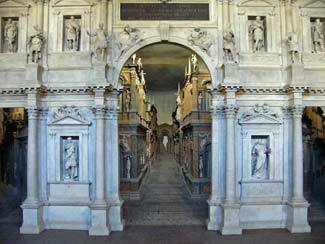 Our own favorite "must see" attraction in Vicenza is the Teatro Olimpico, which was Andrea Palladio's final work. The theatre, built above the dungeons of a ruined castle, was begun just six months before Palladio's death in 1580 and completed by his son, Silla Palladio, and the architect Vincenzo Scamozzi in 1585. Today, it's the oldest surviving indoor theatre in Europe. The Teatro Olimpico is on the Piazza Matteotti, around the corner from the tourist office and just a few blocks northeast of the Basilica. You enter through the brick walls of the old castle. A path leads through the Olimpico Gardens and into the theatre building, part of which was converted from the city's former prison. A balustrade and a row of statues line the back of the cavea, and the restored ceiling is covered with paintings from 1914 that were based on drawings from 1620. The Teatro Olimpico also has a small bookstore and postcard stand in the handsomely decorated lobby, where you can buy the Guide Teatro Olimpico as a souvenir. The theatre is still used for plays, concerts, and festival performances. (See the Teatro Olimpico Web site). Visiting hours depend on the time of year.